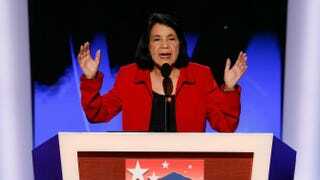 Dolores Huerta nominates then-Sen. Hillary Clinton for president during day 3 of the Democratic National Convention at the Pepsi Center in Denver on Aug. 27, 2008. After legendary human rights and political activist—and longtime Hillary Clinton supporter—Dolores Huerta was silenced while attempting to provide English-to-Spanish translation services Saturday at a Las Vegas Democratic caucus gathering at Harrah’s Casino, the hashtag #EnglishOnly swiftly began trending online, and supporters of Sen. Bernie Sanders (I-Vt.) found themselves playing defense across social media. Actress America Ferrera, another Clinton supporter, co-signed Huerta’s version of events; but it wasn’t long before actresses Susan Sarandon and Gaby Hoffmann, both Sanders supporters, disputed Ferrara’s and Huerta’s claims. Sanders supporter Erin Cruz also stepped forward to push back against “English only” claims, saying that neither Clinton’s nor Sanders’ camp was enthusiastic about the chaos that was unfolding. Between the blurry video footage and conflicting reports, what was supposed to be an exercise in democracy has turned into a political circus. The phrase “English only” is both politically and racially charged, and not merely because of its inherent bigotry. There is a movement in the United States that many critics call “English Only,” led by so-called patriots who believe that English should be recognized as the nation’s official language. This dismisses the prevalence of Spanish—the second-most-spoken language in the country—and marginalizes Spanish-speaking Hispanic and Latino people. Language barriers are a form of segregation, and being associated with such an inflammatory phrase is not healthy for a Sanders campaign that is already sensitive to accusations of misogyny, racism and paternalism. So it makes sense that time and energy are being spent attempting to distill the truth from the political madness. But we do know this: The Nevada Democratic Party is at fault here. Even if “English only” was not yelled out in words, it was acted out in deed. Latino and Hispanic voters were neglected and taken for granted. The Nevada Democratic Party created an extensive list of what it looks for in a “top-quality caucus organizer,” and the ability to speak Spanish or recruit qualified, Spanish-speaking precinct chairs is conspicuously absent. Every single caucus site should have had a neutral Spanish translator available. And unlike the veracity of the “English only” claims, the fact that the state party did not is an unambiguous failure. The Hispanic and Latino population in Nevada stands at approximately 27.8 percent. Over 194,000 Latinos and Hispanics in the state are registered to vote, a number that accounts for 13 percent of the electorate. Democrats are blatantly courting Hispanic and Latino voters, despite—or maybe because of—the Obama administration’s increase in deportations and night raids. The least the party can do is care enough to include them, plan for them, and give a damn about whether or not they fully participate in the democratic process. Isn’t that just how racism works, though? How privilege works? The system is constructed to exclude everyone who isn’t white, who isn’t able-bodied, who isn’t Christian, who isn’t male or cisgender or heterosexual. So when English-speaking caucusers were given the choice—their own language privilege versus equality of representation for Latino and Hispanic groups—many chose themselves without apology. That is how systems of exclusion perpetuate. Nice, liberal people buoyed by privilege, who would never think to sacrifice it for progress, but who are just so very, very sorry they could not do more. So-called progressives who have every right to voice opposition to a campaign surrogate translating during the Nevada caucuses, and who every right to say, through words and deeds, to Hispanic and Latino voters that those rights come first. They have every right to believe that those rights—language, racial, cultural and political—must never appear to be compromised because, above all else, those rights are the ones that matter most. Because America told them so. So, yes, it absolutely matters whether or not “English only” was screamed at the Las Vegas caucus site and in what context. It matters more, though, that while so many people are arguing over who said what to whom and why, Nevada Democratic Party officials have yet to issue a statement of apology or acknowledgment that it is they who failed to fully include U.S. citizens in the democratic process in the first place; nor have they outlined what steps they plan to take to ensure that it never, ever happens again. And when they do publicly apologize and outline their plan—because they must—they need to make sure they say it, write it and read it out loud in English and in Spanish.